We can count the number of records in a table with different combinations. Let us first count the total number of records in the table with this count command. Output of above query is here. This will display total records under the name total_record in the table student. Now we can add some condition to this SQL to count the records with different conditions. Let us find out the number of students in class Four in out table. This will return the count of students in class four only. Here since we are displaying only one count for a fixed class so we can use this way. We may require to display total of each class in a table so here we have to use GROUP BY clause to display totals of each class. We can count the records in different combinations like finding out the number of students of class four who has got more than 60 mark. Ouput of above query is here. 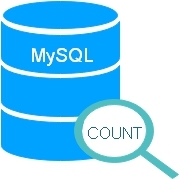 In above query we have used all the columns to find out the total number of records ( by using count(*) ) . In our student table we have id field which is unique and auto incremented. So if we apply count to this id filed then it will more efficient. We will keep two variables as $dt1 and $dt2 with two dates. Here date must be in Y-m-d format. Here is the code to change the date format and the query. This query will return the number of records found between two date ranges. We will use if condition checking to create a gride view. We have two tables, one is storing products (table name product) and other one is storing sales record ( table name sale) . We will get the number of records by linking these two tables. In above case there is no information about the products for which there is no record available in our sales table. By Left join of tables. If you are displaying records of a table then at the same time you can display number of records. Here is the code . please tell me the query if i want to count the no. employees from a table emp_detail (and display it) and also need to see the different entries of a different table course_detail ? I need to see them on single web page together..
u r done a very good job. i need the answer for how to get the totals of the three columns in the table. how to get the totals of between two given date. hi..plz help me out. i like to get count of records in the table ( included deleted recors ). in other words.. the number of records from the table creation. You have to use SQL , All database supports SQL to manage data. By using if condition you can create grid view, this part is added to the main contain of this page.